TAB Computer Systems, Inc. always welcomes interest in joining the TAB team as a qualified IT professional. Please email your resume to humanresources@tabinc.com with a subject line of “Resume for TAB”. 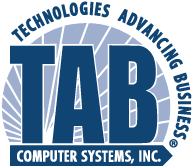 TAB has been around for over 35 years! We're not going anywhere, in fact, we are growing and have been ever since we opened our doors in 1983! If you are looking for a rewarding career at a company that values their employees, contact us! We offer a competitive salary, benefits, 401K and bonuses. Also, we have company paid Yoga classes and lunches on Fridays, a real Christmas Party (with bonuses) and a bunch of nice people to work with! A strong background in Microsoft Operating Systems such as Windows Server 2012 / 2008 as well as Windows Small Business Server 2011 / 2008 is required. Also required is a solid understanding of Virtual Server technology as well as in-depth knowledge of Exchange 2016 / 2013 / 2010 / 2007. Familiarity with Windows Server 2016, Office 365 and Microsoft Azure a plus. The position also requires a minimum of 3 years of active field experience and various Microsoft Certifications. The technician will perform a variety of technical tasks, including but not limited to Server and workstation installs. Familiarity with Firewalls, Routers and other networking devices is required. VOIP phone system installations and support including network infrastructure to support (VLAN’s, QOS, etc.) They also must possess the ability to diagnose, repair and service all components in a small to medium business computer environment. Experience with software applications commonly found on servers and workstations, as well as the ability to troubleshoot the same is desired. TCP/IP and Network services such as DNS, DHCP, etc. The ideal candidate would hold a Windows Server 2012 MCSE. If not a 2012 MCSE than a MCITP Enterprise Administrator / Server Administrator certification. Applicant must hold a minimum of a MCTS.